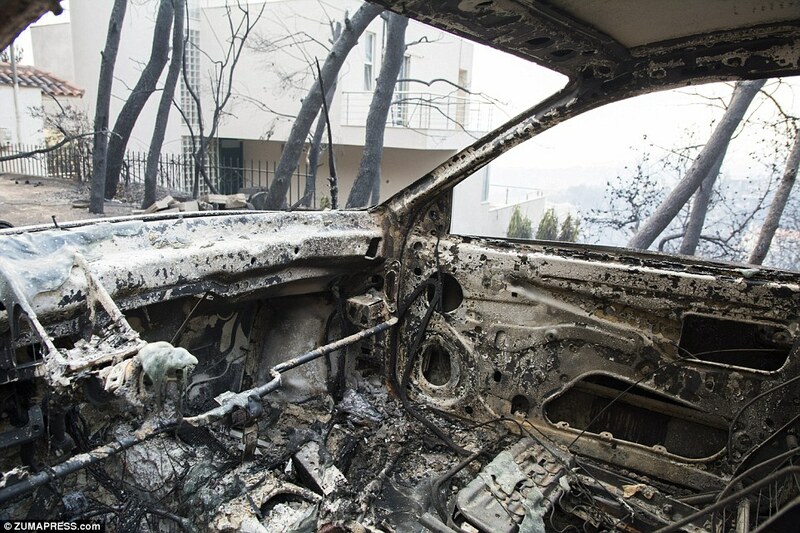 Rafina, Greece: On July 23-24, 2018, 74+ people died to a raging wildfire that experts say was fueled by gale force winds and dry summer conditions. This is the headline that is pumping through mainstream media coupled with tragic examples of how people died and the heroic attempts that went into trying to save them. Scrolling through the released pictures, however, something does not seem right. 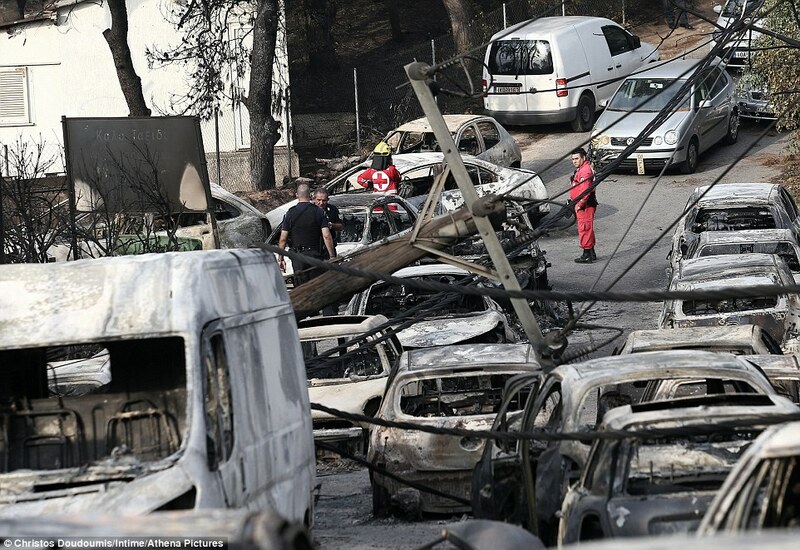 Engine blocks totally fried out of the cars – alloy wheels completely melted into a liquid and fused into the streets while surrounding buildings, asphalt and trees just a few feet away remained untouched. How would the alloy wheels have been affected by enough heat to melt into the street without anything else around them being affected? Look at the Volkswagon at the top right in the picture below. Notice the front passenger tire is melted into the street, yet the rest of the car is intact. How are the wooden electrical poles not incinerated? 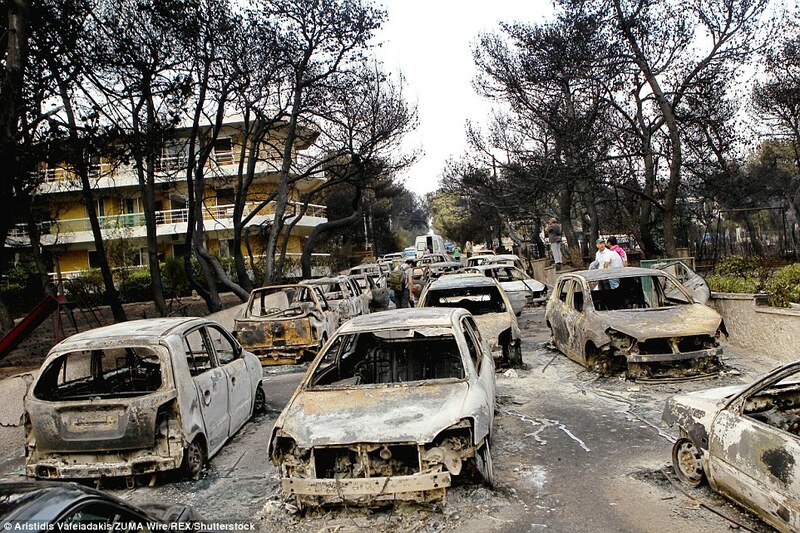 Look at all the untouched twigs, leaves and branches all along the sides of these cars? Even the sign on the left is still standing, yet I am sure is made of material that needs much less heat to melt. How about this next picture. 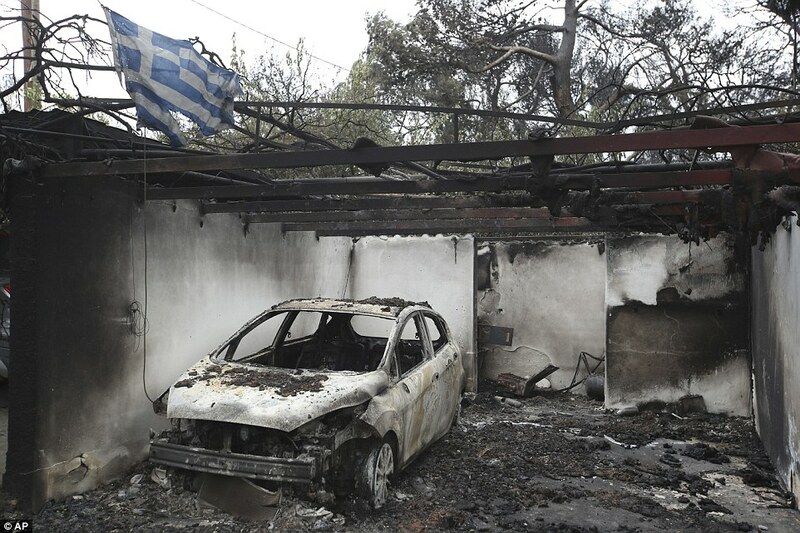 Again the aluminum alloy wheels melted, but the flag and the wooden beams directly above it remain intact? Check out this next picture. That is melted glass you are seeing. According to the World Book Encyclopedia: Glass melts at 2600-2900 °F (1425-1600 °C) depending on its composition. In the most extreme cases, wildfires have been reported to reach temperatures of 1200°C (2,192°F). Flames were reported being concentrated and spotted, shooting hundreds of feet up into the air. These are not the characteristics of a natural wildfire spawned by hot temperatures and fueled by brush and woodland. 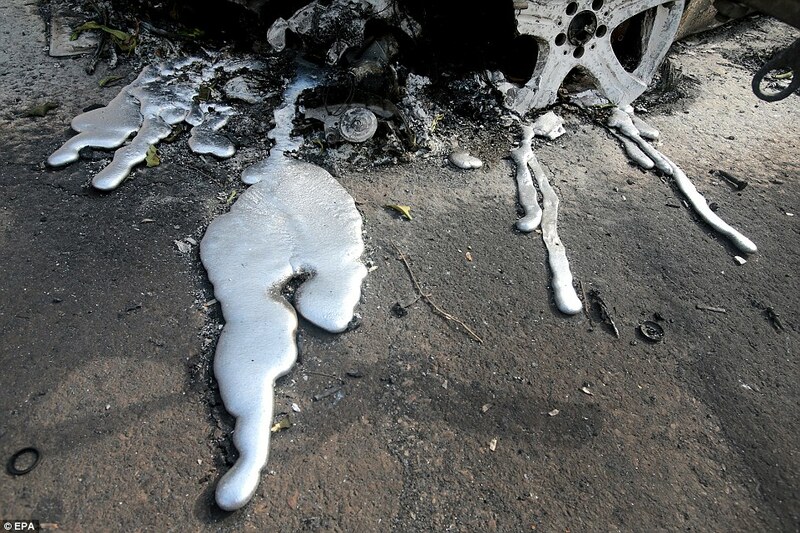 This was a fire that melted glass and aluminum alloy wheels in extremely concentrated areas, leaving surrounding buildings and vegetation unharmed. 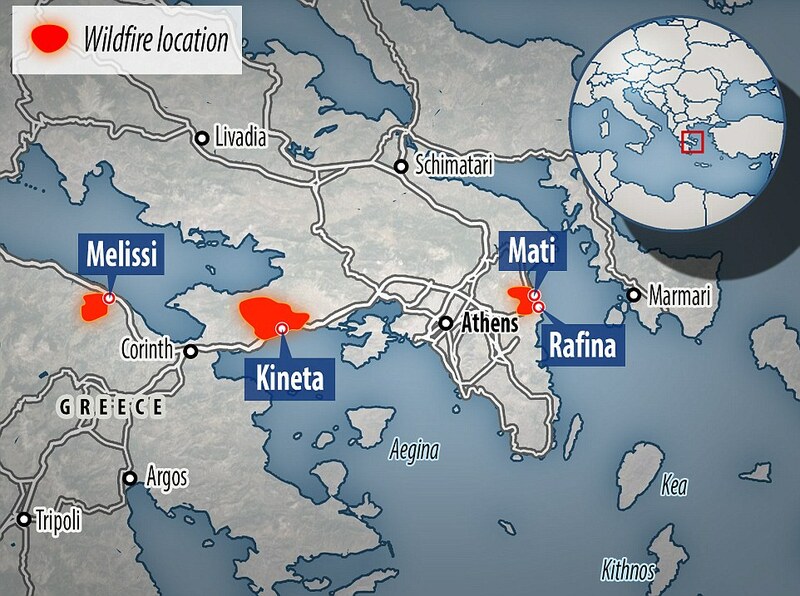 What makes this even stranger is that 15 simultaneous wildfires started at the exact same time in 3 different areas around Athens, Greece. Why the aid of US drones? What could have really caused these fires and for what purpose? So why go through the effort of using these weapons in Greece. Are they simply testing their weapons? Another possible motive is indicated in the image below. Nothing as of yet could be verified, however, if anyone reading this has any information on whether or not this could be true, please comment below. As many are beginning to point out, several California wildfires have the exact same characteristics: melted glass and aluminum while vegetation a few feet away remains untouched; fires springing up in concentrated pockets and having what many are calling a ‘flamethrower’ effect. Our world is on fire. Soaring planetary temperatures may not be the sole culprit. Evidence continues to mount that we may be under attack in order to serve a sinister agenda. Planes Hover Mid Air, Even Vanish. Holograms Disguising Aircraft? CERN?